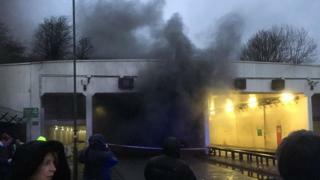 A car fire in a road tunnel led to one of Manchester Airport’s runways being closed – causing delays to some flights. The blaze broke out in Wilmslow Road, underneath runway one, at about 18:00 GMT Cheshire Police said. Photos from the scene showed plumes of smoke billowing out of the underpass. All flights had been diverted to runway two as a precaution but normal runway services have now resumed. The airport said some planes were delayed and passengers should check the status of their flight with their airline. Eyewitness Dale Beardsall said the fire started when a vehicle “burst into flames with a bang and soon after smoke began to billow out”. Passengers had reported being stuck at foreign airports as a result, while others said their flights had been diverted to Liverpool, Birmingham and Leeds Bradford Airport. ← Will SpaceX be ready to fly tourists around the moon?